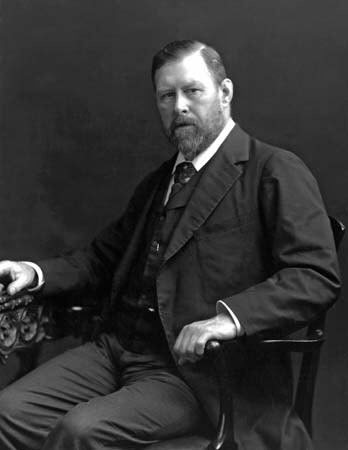 Abraham "Bram" Stoker (1847 - 1912) has been immortalized as the author and creator of the gothic novel Dracula which was first published in 1897. Interestingly, during his lifetime, the Irish-born author was not known for his writing, but for being the personal assistant to actor Henry Irving, and business manager of Irving's Lyceum Theatre in London. "I was naturally thoughtful, and the leisure of long illness gave opportunity for many thoughts which were fruitful according to their kind in later years." One can imagine the exercise of imagination that would be stimulated by the child's solitary hours. Stoker made a complete recovery, going on to excel at athletics, earning the "University Athlete" distinction at Trinity College in Dublin (1864-1870). Stoker graduated with honors, earning a B.A. in Mathematics, and serving as president of the Philosophical Society. He pursued writing both fiction and non-fiction, his first paper titled, Sensationalism in Fiction and Society . In 1876 while a civil servant in Dublin, Stoker wrote the non-fiction book The Duties of Clerks of Petty Sessions in Ireland (1879). Throughout his lifetime, Stoker maintained an interest in art, founding the Dublin Sketching Club in 1879. Interestingly, Stoker was inspired by Joseph Sheridan Le Fanu, acclaimed for his vivid gothic tales, particularly the female, lesbian vampire character, Carmilla (1872). They became friends, when Le Fanu co-owned the Dublin Evening Mail , for which Stoker was employed as a theatre critic. Stoker went on to write Dracula in 1897, which became the pillar of gothic romance, adapted countless times in numerous literary forms for generations. Stoker is featured in our Gothic Literature Study Guide. Enjoy reading his works, along with plenty of other spooky tales in our collections, Gothic, Ghost, Horror & Weird Library and Halloween Stories.